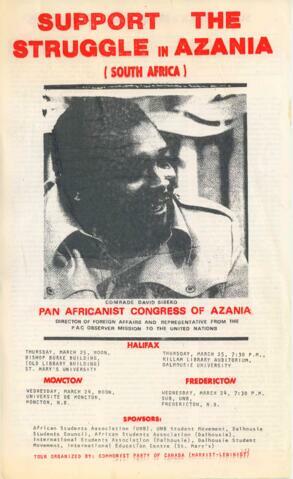 File contains a poster for lectures by David Sibeko of the Pan Africanist Congress of Azania as part of a tour organized by the Communist Party of Canada (Marxist-Leninst). The tour was sponsored in part by the Dalhousie University African Students Society. A brief notice of the talk at Dalhousie University appeared on page 10 of The Dalhousie Gazette, Volume 108, Issue 24, published on March 18, 1976.